Solution: Titration of an acidic solution of Na2C2O4 with KMnO4(aq). 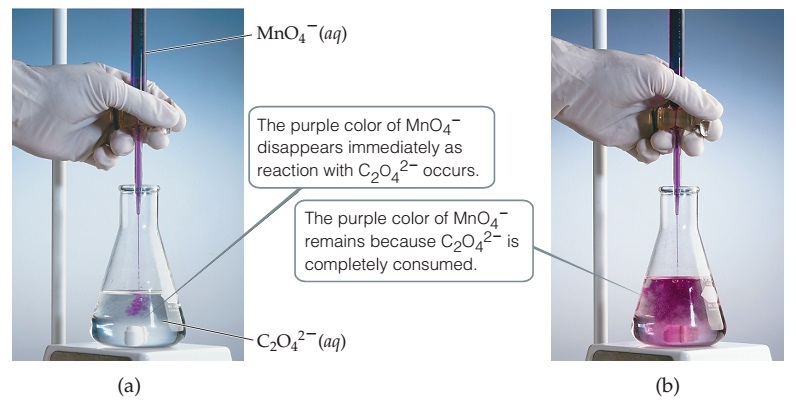 The balanced chemical equation for this reaction is: 16 H+(aq) + 2 MnO4-(aq) + 5 C2O42-(aq) → 2 Mn2+(aq) + 8 H2O(l) + 10 CO2(g) Which species is the reducing agent? Titration of an acidic solution of Na2C2O4 with KMnO4(aq). Which species is the reducing agent?